Participants are responsible for their own booking. You can book your accommodation on the hotels below during the registration process [Deadline for hotel reservations with the presented rates is August 31, 2019 always depending on the hotel availability on the moment of the reservation. Reservations will be made on a first come first served basis. After this date reservations are available “on request basis”], or you can choose another option that best suits your needs. The uniqueness of its location makes Myriad by SANA Hotels a majestic hotel: standing by the Tagus River in eastern Lisbon, the 140-meter tall building is an insight into the future. All rooms are equipped with multimedia connection for MP3 player, Wireless Internet (free of charge), whirlpool bath and/or shower with water jets and the suites have a separate living room, work desk, coffee machine and mini-bar. This amazing hotel features the River Lounge Restaurant on the ground floor, with Portuguese and international cuisine, and endowed with an outdoor seating area with exceptional views over the Tagus estuary, a panoramic rooftop restaurant which, in addition to dinner service is available for events. 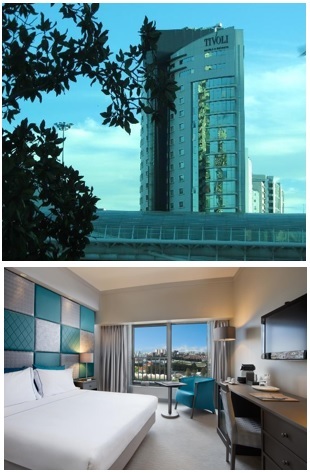 With a stunning view out over the river and Parque das Nações (former Expo site), the Tivoli Oriente has 279 soundproofed rooms, including 16 junior suites, 1 senior suites and 4 rooms for disabled guests, all equipped with individual air conditioning, direct dial telephone, Internet, cable TV, Pay TV, safe and mini-bar. The “Tivoli Caffè Oriente” with a superb view of Oriente Station, 12 meeting and banqueting rooms (setup for 400 people), Internet Center, as well as an indoor pool, Jacuzzi, sauna, Turkish bath and a gym. Also note the 24-hour room service, laundry service, free Wi-Fi Internet access, business centre, tours and excursions, car rental and the garage (surcharge). 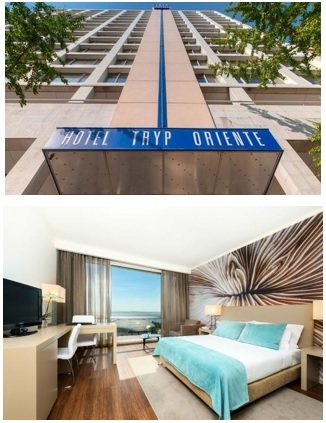 Right in the heart of Parque das Nações, the Hotel Tryp Lisboa Oriente was recently refurbished with “Expo 98” and the Oceans as its background. At the entrance, visitors are met by a series of ocean aquariums together with a canvas, in the reception area, representing the great architectural landmarks. 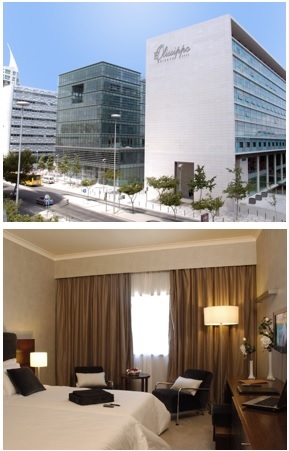 It has 217 rooms, featuring Family, Fitness, Premium and Executive Suite which emphasise elegance, modernity and comfort, and are characterised by the marine environments, alternating between the blue of the rooms looking out towards the Tagus and the coral red of those which lend a view of the heart of the city. All rooms are equipped with free Internet Wi-fi, a TV with satellite channels, lounge area, telephone and air conditioning. Also note the room service, laundry service (extra charge), Wi-Fi Internet throughout the hotel, business centre and private garage. The Olissippo Oriente has 182 rooms, including 14 suites, 2 rooms adapted for guests with reduced mobility and 26 rooms for non-smokers. All the rooms are soundproofed and equipped with air conditioning, broadband Internet, LCD TV, telephone, mini-bar and hairdryer. In this unit you may find a restaurant, a bar, a coffee shop, a terrace, as well as 5 meeting and banqueting rooms with a maximum capacity for 350 people. Also note the room service, laundry service, Internet and private parking. The VIP Executive Arts is a non-smoking hotel that combines design, avant-garde technology, comfort and excellent service. It offers 300 soundproofed rooms, including 8 suites and 1 presidential suite, all equipped with air conditioning, telephone, cable TV, Internet service Wi-Fi, safe, mini bar and private bathroom. This hotel has a restaurant with national and international specialties, a bar, 8 meeting rooms and banquet facilities, an auditorium with capacity for 165 people, a living room with TV and shops. Also note the room service, laundry service, currency exchange, Wireless Internet in public areas, business center, car rental and private parking. 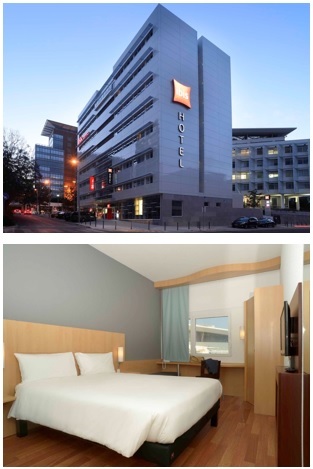 Hotel Ibis Lisboa Parque das Nações is a quiet Lisbon hotel, a 15-minute drive from the city centre. Sited in the Parque das Nações, it is a 10-minute walk from attractions such as the Atlântico Pavillion or the Lisbon Casino. The non-smoking rooms at the hotel feature either double or twin beds, work desk, free WiFi, wooden floors, flat-screen TV and a private bathroom with a shower. A varied breakfast buffet is served each morning between 6:30 and 11:00 for all Ibis guests. The Parque das Nações has many restaurant options available, ranging from traditional Portuguese meals to international dishes. The restaurants are accessible within 300 m of the Ibis. The Lisbon centre is a short drive and has shops, cafés and restaurants. 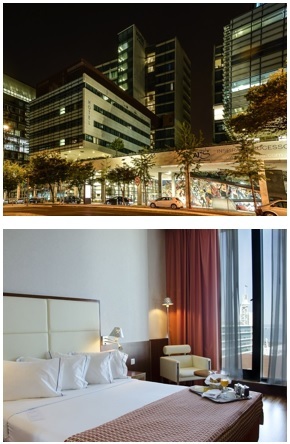 It is a 10-minute walk from the Lisbon Casino and an 18-minute walk from the famous Oceanarium.